Tympanocentesis is a minor surgical procedure that refers to puncture of the tympanic membrane with a small gauge needle in order to aspirate fluid from the middle ear cleft or to provide a route for administration of intratympanic medications. The procedure was described in 1768 and has been used since to treat acute otitis media (AOM). It was particularly popular in the preantibiotic era, but its use has since declined. It is now used mainly for the management of complex cases that have not responded to antibiotic therapy,  as well as facilitating the delivery of medication directly to the middle and inner ear. The primary functionality of the middle ear (tympanic cavity) is that of bony conduction of sound via transference of sound waves in the air collected by the auricle to the fluid of the inner ear. The middle ear inhabits the petrous portion of the temporal bone and is filled with air secondary to communication with the nasopharynx via the auditory (eustachian) tube. The tympanic membrane (TM) is an oval, thin, semi-transparent membrane that separates the external and middle ear (tympanic cavity). The TM is divided into 2 parts: the pars flaccida and the pars tensa. 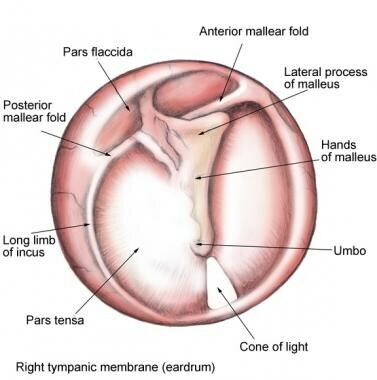 The manubrium of the malleus is firmly attached to the medial tympanic membrane; where the manubrium draws the TM medially, a concavity is formed. The apex of this concavity is called the umbo. The area of the TM superior to the umbo is termed the pars flaccida; the remainder of the TM is the pars tensa (see the image below). Tympanocentesis is a diagnostic and therapeutic procedure used in the treatment of a wide range of otological disorders, including acute otitis media, chronic otitis media with effusion, tympanic membrane retraction, sensorineural hearing loss, and Ménière disease. Tympanocentesis can be performed under general or local anesthesia. Some patients, such as those with an acutely infected and painful otitis media, may not need anesthesia. The use of local anesthesia is favored in a cooperative patient because of its safety, faster recovery, earlier discharge from hospital, reduced costs, reduced bleeding (when combined with a vasoconstrictor), and the ability to perform the procedure in the outpatient clinic. The tympanic membrane can be effectively anesthetized by either field infiltration or the application of topical anesthetics. Both methods require consent from the patient or caregiver. For more information, see Topical Anesthesia and Infiltrative Administration of Local Anesthetic Agents. Infiltration typically involves injection of a local anesthetic agent (eg, lidocaine and prilocaine), circumferentially into the subcutaneous layer of the distal external auditory canal. It provides effective anesthesia and, if combined with a vasoconstrictor, it can reduce intraoperative bleeding. Topical anesthesia is preferred method for minor otological procedures, including tympanocentesis. It refers to the direct application of traditional local anesthetic agents such as lidocaine, cocaine, and phenol as well as newer techniques, such as iontophoresis and eutectic mixture of local anesthetics (EMLA). In all topical applications, the middle ear mucosa may continue to be sensitive; hence, the procedure is not a painless one. Iontophoresis is a noninvasive method that uses direct current to propel a high concentration of charged anesthetic molecules across the tympanic membrane. Anesthetic solution, such as 4% lidocaine, is inserted in the external auditory canal and current of 0.5 nA is administered for 10 minutes via a negative electrode. Aural syringe, dental syringe and needle, pledgets, iontophoresis devices, and electrodes may be required. Position the patient supine, with the head rotated away from the operator, to allow visualization of the tympanic membrane using an appropriately sized aural speculum. Clear the external ear canal of any wax that might obscure the view. Administer a local anesthetic agent in one of the methods described above in Anesthesia. Connect the spinal needle to the 3-mL syringe, and bend the needle close to the attachment by about 45 degrees to allow easier visualization past the needle when it is in the external ear canal. Ensure that the syringe plunger is mobile and aspirate 1 mL of air. Optimal visualization is of prime importance. Take care to use the largest aural speculum that fits the external ear canal, and do not proceed beyond the hair-bearing skin. Use a low magnification on the operating microscope to ensure orientation, and clearly identify the handle of the malleus and the inferior half of the tympanic membrane. Then increase the magnification of the microscope to allow precise placement of the needle. Carefully advance the needle to the tympanic membrane, taking care not to damage the ear canal skin. 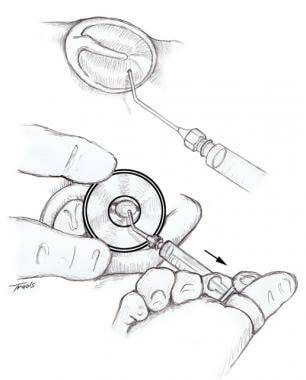 Illustration showing tympanocentesis with a needle in the lower half of the tympanic membrane. Tympanocentesis. Courtesy of Hamid R Djalilian, MD. In cases where injection into the middle ear space is the aim, create another perforation to help relieve pressure by letting air escape while fluid is injected (the so-called "blow-hole"). In laser tympanocentesis, a special adapter on the CO2 laser holds a mirror that is spun to create a small circular pattern. When fired, the laser instantaneously creates a small perforation, alleviating pressure from acute otitis media. Standard laser precautions must be observed. Asking a patient to do a modified Valsalva maneuver (pinch nose and blow up cheeks) elevates some tympanic membranes off the medial wall of the middle ear. This alleviates the need for a tympanocentesis to see if the tympanic membrane is fixed to the medial wall. Some patients may well tolerate the procedure without anesthesia, if a small sharp needle is gently used in a rotary fashion to create a small opening. Creating a so-called blow-hole (a second opening on the tympanic membrane) allows air to escape during injection of medication and prevents pressure building up in the middle ear cleft. Even with topical anesthesia, the medial surface of the tympanic membrane may still be sensitive, and some amount of pain is likely during the procedure. A small amount of bleeding may occur, but it should stop spontaneously and should not be a reason for concern. The tympanic membrane should heal spontaneously over the following few days to weeks, but a small risk of a permanent perforation does exist. In the short term, this may well be beneficial, as it may alleviate pain during future episodes of acute otitis media. In the long term, recurring infections due to water entering the middle ear space may necessitate a myringoplasty to close the perforation. Although damage to middle ear structures, including the ossicles and facial nerve, is possible, it should not occur with a carefully performed procedure. Pichichero and Poole studied the diagnostic accuracy of pediatricians and otolaryngologists as well as their tympanocentesis skills at a conference. Overall, 50% of pediatricians and 73% of otolaryngologists correctly diagnosed the condition (acute otitis media vs otitis media with effusion), while 83% of pediatricians and 89% of otolaryngologists optimally performed tympanocentesis. This highlights the fact that acute otitis media and otitis media with effusion may often be misdiagnosed. Tympanocentesis is a useful adjunct in these conditions, helping with both diagnosis and treatment. MJ Friedman. Tympanocentesis. C King, FM Henretig, BR King, J Loiselle, RM Ruddy. Textbook of Pediatric Emergency Procedures. 2nd ed. Lippincott Williams & Wilkins; 2007. 56;600-3. PJ Jones. Tympanocentesis. E Reichman, RR Simon. Emergency Medicine Procedures: Text and Atlas. McGraw-Hill Professional; 2003. 143;1273-6. Kaplan DM, Gluck O, Kraus M, Slovik Y, Juwad H. Acute bacterial meningitis caused by acute otitis media in adults: A series of 12 patients. Ear Nose Throat J. 2017 Jan. 96 (1):20-28. [Medline]. Garcia C, Salgueiro AB, Luís C, Correia P, Brito MJ. Acute mastoiditis in children: Middle ear cultures may help in reducing use of broad spectrum antibiotics. Int J Pediatr Otorhinolaryngol. 2017 Jan. 92:32-37. [Medline]. Sing TT. Use of phenol in anaesthetizing the eardrum. The Internet Journal of Otorhinolaryngology. 2006. 4(2):[Full Text]. Sirimanna KS, Madden GJ, Miles S. Anaesthesia of the tympanic membrane: comparison of EMLA cream and iontophoresis. J Laryngol Otol. 1990 Mar. 104(3):195-6. [Medline]. Shaikh N, Hoberman A, Kurs-Lasky M, et al. Pain management in young children undergoing diagnostic tympanocentesis. Clin Pediatr (Phila). 2011 Mar. 50(3):231-6. [Medline]. Slovik Y, Raiz S, Leiberman A, Puterman M, Dagan R, Leibovitz E. Rates of tympanic membrane closure in double-tympanocentesis studies. Pediatr Infect Dis J. 2008 Jun. 27(6):490-3. [Medline]. Pichichero ME, Poole MD. Assessing diagnostic accuracy and tympanocentesis skills in the management of otitis media. Arch Pediatr Adolesc Med. 2001 Oct. 155(10):1137-42. [Medline]. Potsic W, Cotton RT, Handler SD (ed). Surgical Pediatric Otolaryngology. New York, NY: Theime Medical Publishers, Inc; 1997. 10.